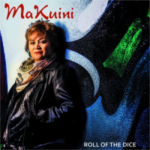 Share the post "EP review: MAKUINI – Roll The Dice"
There’s blues and there’s blues. While the contemporary blues world is dominated by virtuoso guitar slingers and jazzers who fall back on the genre due to a lack of material, there’s also a raft of artists who use the blues as launch pad for new frontiers. Maori blues singer Makuini (pronounced Ma Queenie and meaning white queen) on the other hand, has lived the blues she sings about. Blues in her hands isn’t the usual tale of woes real or imagined, but rather songs that reflect a personal journey and a return to New Zealand after 22 years. It’s music that offers the key to self empowerment as she draws on her own musical past to provide source material for the present. ‘Roll Of The Dice’ is a 5 track EP that reflects a colourful career that has seen the high and lows of playing in low-down LA dives, to appearing at the London Palladium and travelling over 50 countries as part of the ‘Ladies of Soul’ review. Come to that, how many performers can boast having played opposite Yul Brynner’s bald pate? She’s savvy enough to turn her experiences into meaningful narratives as on the autobiographical ‘I Am The River’, albeit, it was written by her sister Heeni Kuini, who contributes 2 songs on the EP. As Makuini explains, her personal journey started from the Whanganui river rather than the Mississippi delta, but you’d be hard pushed to notice the cultural difference as she has the kind of arresting voice that takes a song and shapes it to her own ends. But the influences add up to a unique take on the blues. The strength of ‘Roll The Dice’ is the way in which her character and personality comes through in the songs. It’s a refreshing change from the micro managed careers that dominate the contemporary blues scene. She’s joined by an intuitive band, including 10cc drummer Paul Burgess and former Climax Blues Band keyboard player George Glover, who in the manner of most of this album, adds perfect layered organ fills on the soft brushed shuffle of ‘Down On Their Luck’. It’s a song that emphasises her ability to transform a well worn story into something with feel and meaning. Only a slight waver in her closing phrasing robs the song of a real authoritative performance. Makuini is that rare thing, a great singer who has the ability to bring both heartfelt meaning and ironic scrutiny to bear on the blues. She is no more biting than when she dissects the ‘Corporate Man’ thus: ‘Promises diamonds to the working man, promises diamonds, keep to the plan, no to this cash cow, he’s just flash, hell it won’t last, the modern day cowboy just your dollars in his hand’. It’s the perfect opening track on which Sarge Frampton adds wonderful slide in a brief glimpse of his guitar skills. How ironic if a great song like this failed to get play listed because of its subject matter. Makuini and her band really get inside the material. Nothing ever sounds forced or over played and the arrangements let her voice breathe and ultimately fill each track with real presence and expression. ‘Move Over’ is a big band arrangement featuring Steve Parry on horns, and is well suited to her effortless range. It’s nicely juxtaposed by the down-home feel of ‘Ko Au Te Awa’. Sung in her native Maori tongue, the song perfectly illustrates the clarity of her phrasing and explains her other role in life as a vocal coach. You might not be able understand a word, but she draws you in on a stop-time arrangement with neat bv’s and a relaxed delivery. Blues as an international language never sounded so refreshing. This entry was posted in All Posts, Single and EP reviews and tagged 10CC, Billie Hollliday, Climax Blues Band, Etta James, George Glover, Heeni Stirling, Janis Joplin, Makuini, Paul Burgess, Roll The Dice, Sarge Frampton, Steve Parry. Bookmark the permalink.